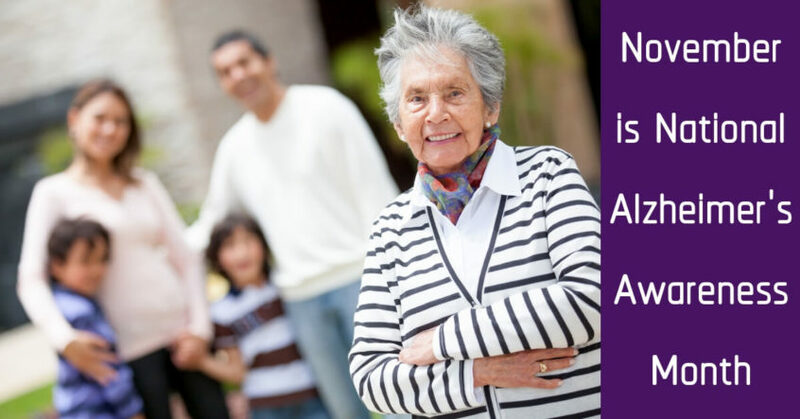 November is National Alzheimer’s Awareness Month! Since November was designated as National Alzheimer’s Awareness Month in 1983 by President Ronald Reagan, rates of Alzheimer’s Disease have continued to rise. In the early 1980s, the national rate of Alzheimer’s was around 2 million, but that number has more than doubled in the last 35 years, and today around 5.4 million Americans are living with this degenerative brain disease. Alzheimer’s Disease is a degenerative brain disease that attacks the cells in your brain, causing cell degradation and death. As you lose white matter in your brain, you will begin to notice problems in memory, coordination, problem solving, and critical thinking. You may start by forgetting appointments or the date, and often misplace things. Soon you might struggle to remember events, or things you’ve learned. It will take you longer to perform simple tasks, and even following a recipe you’ve made a hundred times before can be a challenge. As the disease progresses, you’ll begin to experience problems with communication, have difficulty finding the right words, and have a hard time understanding what’s being said. You may start to lose track of time, or even forget what year it is. Finally, as the disease affects more of your brain, you’ll have difficulty performing the tasks of daily life, like getting dressed, feeding yourself, or even walking. What Does Hearing Loss Have to do with Alzheimer’s Disease? When you think about Alzheimer’s Disease, you might not immediately think about hearing loss. However, hearing loss and Alzheimer’s disease are closely linked, and hearing loss is a major risk factor for developing Alzheimer’s or dementia. Living with untreated hearing loss speeds up cognitive decline, since the parts of your brain used to process sounds aren’t being used. With diminished input from the ears, these unused areas of the brain start to weaken, and this effects your entire brain health. You’ll start to have more problems communicating, focusing, and performing complex tasks. The best thing you can do to reduce your chances of Alzheimer’s Disease and keep your brain healthy, is to keep your brain active. Learning new skills, making new friends, and getting out of the house are all things that keep the pathways in your brain active, and promote brain health. If you have hearing loss, you might be scared to try new things or meet new people. It can be embarrassing to ask people to repeat themselves over and over, or answer a question inappropriately because you just couldn’t hear what was said. If you’re choosing to stay home rather than going out, you’re increasing your risk of Alzheimer’s. Investing in your hearing health could make all the difference for your brain health. Imagine if you were confident in meeting new people, and were excited about learning a new language, a new instrument, or a new skill? When you treat your hearing loss, your confidence will be restored, and you’ll be able to keep up with old friends, try new things, and keep your brain active and healthy. If you’ve been struggling to hear, visit us today at Hearing Aid Associates where our team of hearing specialists know all about hearing loss and brain health. We’ll be able to recommend the perfect hearing devices that will give you the confidence you need to improve your brain health. Our leading hearing aid designs will help you hear in every listening environment, from the quiet of your living room to Saturday afternoons in the park. You’ll love going to concerts and dinner parties, and enjoy clear communication with everyone. Do the right thing for your brain and your ears, and visit us today for a hearing test.